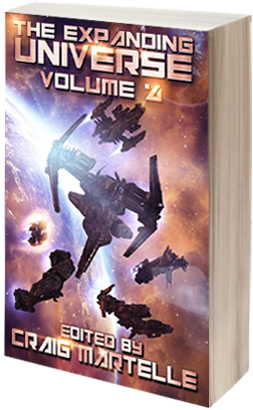 The newest The Expanding Universe anthology, number 4, is now available. Twenty great writers, twenty great stories, at a bargain price on Amazon. After he does this one important thing. When Tornahdo signs on the dotted line, he puts his life into the steady hands of the mighty Ghost Corps. Three grisly deaths and three agonizing resurrections later, he's assigned duty on the space station Enderium Six. Tornahdo must take out the one man responsible for every war between humans and Ultras since the origin of the Ultra bloodline: the immortal king, Pietas. If he succeeds, the war is over. If he doesn't, the Ultras will rule mankind for another thousand years. Kayelle Allen writes Science Fiction with misbehaving robots, mythic heroes, role playing immortal gamers, and warriors who purr. She's a US Navy veteran who's been married so long she's tenured.